A youth jumps high with arms outstretched. 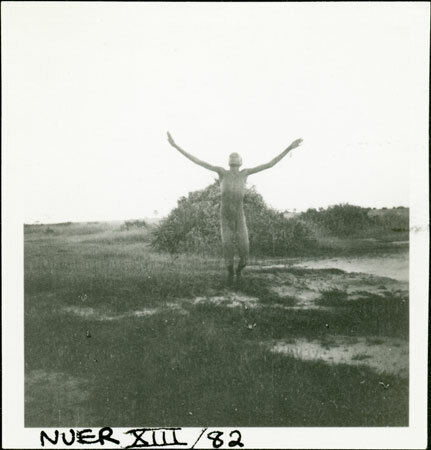 The image is described as Atuot dancing, which suggests that this youth is an Atuot that Evans-Pritchard met during his fieldwork in Western Nuerland in 1936, and who is demonstrating an Atuot dance gesture for the camera. The Atuot are linguistically related to the Nuer, living some distance to the south among the Dinka, and having taken on many Dinka cultural patterns. Note on print reverse ms pencil - "4 Atwot dancing" & print front border ms ink - "NUER XIII/82"
Morton, Chris. "Atuot youth dancing" Southern Sudan Project (in development). 03 Jan. 2006. Pitt Rivers Museum. <http://southernsudan.prm.ox.ac.uk/details/1998.355.641.2/>.